This year’s Guitar Foundation of America Convention officially kicks off next week in Louisville KY, and we couldn’t be more excited to attend! If you are planning to go, we’ll be spending most of the convention meeting folks at the GSI booth and will be eager to see both new and familiar faces. Along with the amazing lineup of concerts this week (David Russell, Antigoni Goni, and Joaquin Clerch – to name a few), we are also looking forward to the countless lectures, masterclasses, and other fantastic events occurring throughout the week. Here are a few we are especially excited to attend! Our good friend Jack Sanders will be giving a lecture on a topic of which he is a leading expert – relaxation. The lecture is titled “Practical Relaxation Techniques for Every Day” and is sure to have lots of applicable tips for guitarists of every level. As an LA local, Jack drops by the GSI showroom on a regular basis and has even recorded a handful of instructional videos for us. As a little preview to his lecture next week, here is a lesson he shot with us on Left Hand Technique and relaxation principles for playing with minimal tension. Each year, one of the highlights for all of us at GSI is experiencing the wide range of guitars put on display at the GFA Luthier Showcase. Many of our favorite young luthiers take advantage of this opportunity to exhibit their new instruments and see how they match up against those built by twenty-nine of their fellow colleagues. Overall, the Luthier Showcase ends up being a fun event for everyone involved, audience and luthiers alike! 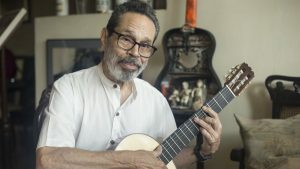 Perhaps the most thrilling part of this particular GFA will be meeting legendary Cuban guitarist and composer Leo Brouwer! In the middle of the week, Brouwer will be giving a masterclass during which we are sure to hear a few of his pieces played. 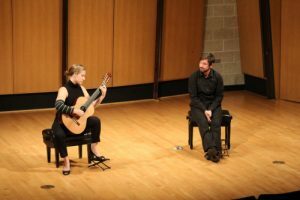 Then at the conclusion of the convention, Brouwer will be inducted into the GFA Hall of Fame, an honor bestowed upon classical guitar greats such as Andrés Segovia, Julian Bream, John Williams, and many more. Needless to say, we are very much looking forward to witnessing Maestro Brouwer’s induction into the ranks!